Where to find Hoodoos, Fairy Chimneys and Goblins! With a little imagination, some fairy tale characters do exist! Utah’s geologic backyard—where some of the wild things are! Looking for some outdoor adventure, but tired of the crowded parks at the same old locations? 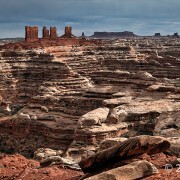 Take a step outside the box, and into Emery County, to discover some exciting places many Utahns don’t even know about. From the spectacular geography at Goblin Valley State Park, to the world-class OHV trails and slot canyons, there are countless new adventures to have and memories to make in Emery County. https://geology.utah.gov/wp-content/uploads/ugs-logo-large.png 0 0 Utah Geological Survey https://geology.utah.gov/wp-content/uploads/ugs-logo-large.png Utah Geological Survey2016-03-07 17:10:382016-08-10 16:34:53Where to find Hoodoos, Fairy Chimneys and Goblins!